Ames, Iowa – July 21, 2015 – Real Property Management Des Moines Select, part of the nation’s leading property management franchise organization, and RentRange, the nation’s leading provider of Rental Market Intelligence™, released their quarterly rental housing statistics that show Ames rental home rates are rising. 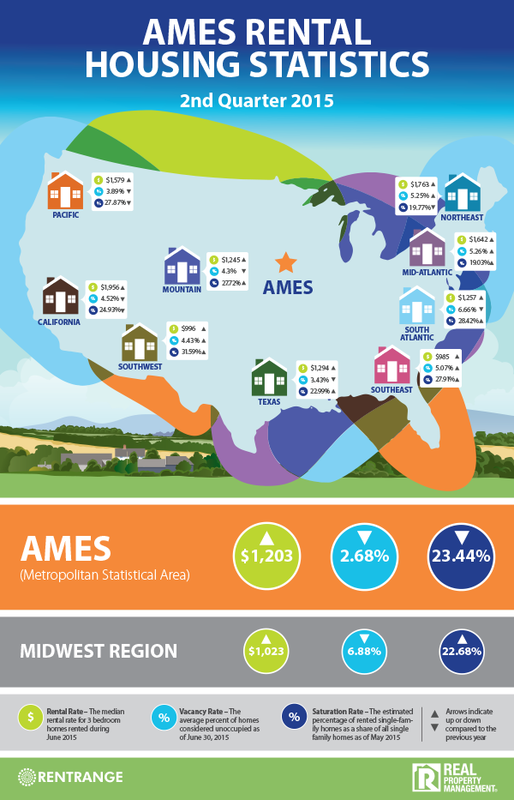 During the second quarter of 2015, the companies found that the average monthly rent for single-family homes in Ames was $1,203, representing a 22.1 percent year-over-year increase. Nationally, home rental rates now exceed $1,320, up 3.3 percent since just last quarter and representing a 6.1 percent year-over-year increase. The rental market data was limited to three-bedroom single-family homes in the U.S. The report also examined vacancy rates in Ames, the percentage of homes considered unoccupied, through the end of the first quarter. The Ames rate fell to 2.68 percent, down .12 percent year-over-year. The national rate fell slightly to 5.46 percent through June, down .12 percent from a year ago. Lastly, the report analyzed the saturation rate in Ames. This is the estimated percentage of rented single-family homes as a share of all single-family homes. In Ames, 23.44 percent of single-family homes are rented, according to the data. As leaders in the rental housing industry, Real Property Management and RentRange have an ongoing strategic business relationship. Real Property Management relies on RentRange’s proprietary rental housing data to provide its landlord customers with accurate, current information about local rental properties and rental markets. Real Property Management is a franchise organization owned by Property Management Business Solutions, LLC, a privately held corporation based in Utah. With over 25 years of industry expertise, Real Property Management provides full-service residential property management for thousands of investors and rental home owners from more than 260 independently owned and operated offices throughout the United States and Canada. For more information about Real Property Management, property management services or franchising opportunities, visit https://www.realpropertymgt.com/ or www.propertymanagementfranchise.com/.